Bridget is thrilled to be working with and leading the UCMB as Band Captain for the 2017-2018 school year! She is beginning her third year at UConn as a Junior in the Neag School of Education for Secondary History & Social Studies Education. 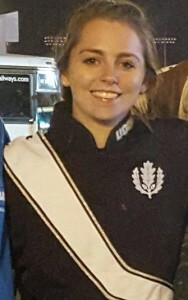 Being involved in many aspects of the UCMB and bands at UConn, Bridget acted as section leader for the saxophones in her sophomore year and has played in the UConn Pep Band for 2 seasons on tenor saxophone and contributed to Concert and Symphonic Bands on bassoon. This will be Bridget’s 7th year in the marching arts, which includes her time at Hawthorne High School where she was Drum Major for 2 years. Aside from band, Bridget is an avid fan of women’s basketball at UConn. She’s excited to see what this season with the UCMB holds!